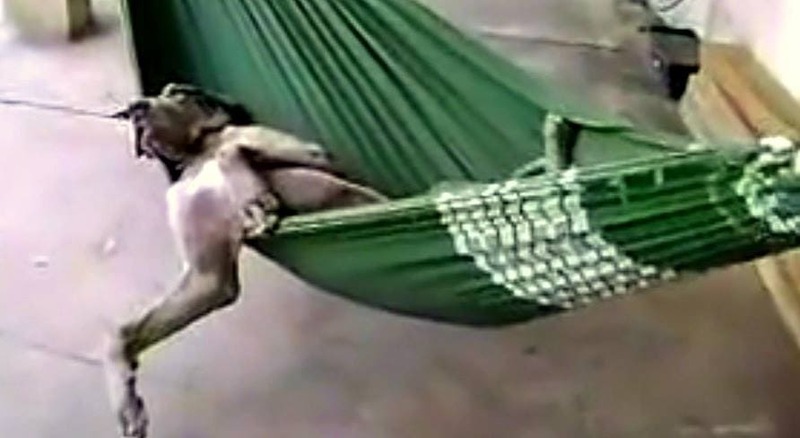 That hammock does look very cozy though…. The man says his home is the safest on the planet because of his private guard dog. Just taking a “Cat Nap” Lol! seriously i have issues getting in a hammock would love to see how he gets in! Naaaa Renee Cormillot Arbogast de los tuyos!! Awesome guard dog. Sweet baby. why today’s posts seems so..”cruel”..
Hey, guard duty is tough work! Steve Abella Maggie Abella sounds about right! He is so comfortable! I love it! This dog isn`t stupid by any means .. he is comfy leave him alone !! That is so Riot!! They are lazy beasts! I have two danes to guard my house. Don’t break in you might be licked to death. I don’t blame him, not at all! Well who wouldn’t in that heat and humidity to be honest!! Best way to relax. Haha. My next door neighbors are from Brazil. I will share this with them.